The aim of this study was to evaluate the removal of the smear layer by some commonly used (needle-and-syringe irrigation, sonic activation, ultrasonically activated irrigation) and new root canal irrigation strategies (negative pressure irrigation and polymer rotary file) using a novel approach by comparing pre- and post-experimental images. Prepared root canals (n = 50) were subjected to a split tooth model and divided into 5 groups (n = 10): (1) needle-and-syringe irrigation (control); (2) sonic activation (SA); (3) negative pressure irrigation with continuous warm activated irrigation and evacuation (CWA); (4) polymer finishing file (FF); (5) ultrasonically activated irrigation (UAI). Smear layer scores and percentage of open dentinal tubules (%ODT) were evaluated by 2 examiners before and after irrigation procedures, from the middle and apical thirds of the root canal, on scanning electron microscopic images. Data were analysed using Kruskal–Wallis and post hoc tests at P = 0.05. Needle-and-syringe irrigation (control) showed no significant difference (both smear score and %ODT) compared to the pre-experimental value (P > 0.05). All other groups showed lower smear scores and higher %ODT, compared to the control (P < 0.05). The lowest smear score and highest %ODT were observed in the CWA group, which was significantly different from all other groups (P < 0.05). SA group showed significantly higher smear scores and lower %ODT than FF or UAI (P < 0.05). CWA showed superior removal of smear layer in the middle and apical thirds of the root canal compared to the other irrigation strategies. 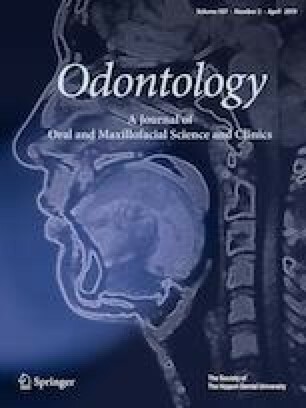 The authors sincerely thank Ms. Samantha Kar Yan Li, Centralized Research Laboratories, Faculty of Dentistry, The University of Hong Kong for the data analysis. This study did not receive any funding from internal or external sources.